A Brown Creeper finds food at the base of a tree during a cold snap in February 2016, Danbury, Connecticut. The fall migration is miraculous when you consider the thousands of miles birds fly from their breeding grounds to their winter havens. It’s also miraculous in its ability to stir excitement into the hearts and bones of otherwise completely normal adult human beings. Well, “completely normal” may be pushing it with some birders I’ve come across, but you know what I mean. Take the other day for instance. I was relaxing on the patio toward the end of a long day when a sight literally lifted me off my seat and drew me closer. Bald eagle? Brown pelican? Some sort of rare bird not seen in generations? No, it was a brown creeper. 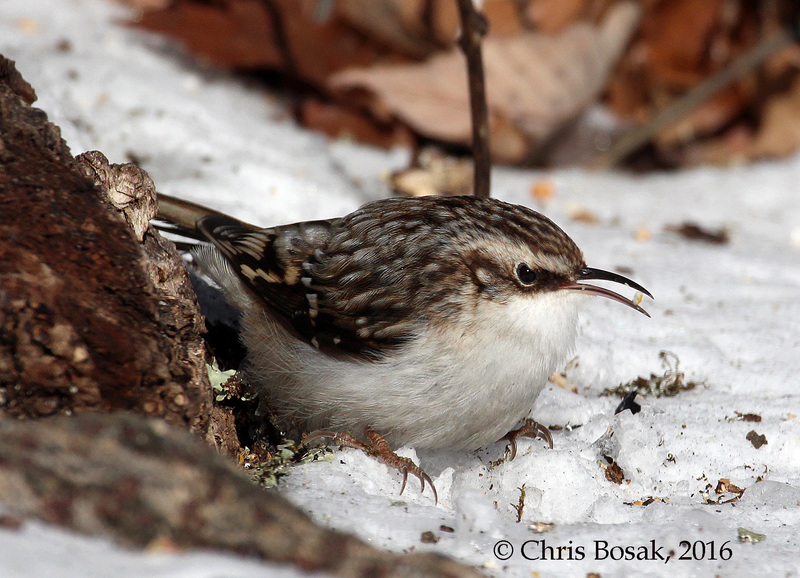 Brown creepers are just as their name suggests they are. For one, they are indeed brown. For another, they creep. They creep up trees looking for insects hidden among the bark. When they reach a point where they think they’ve exhausted a tree’s food supply, they fly quickly to the bottom of the nearest tree and start the creeping all over again. 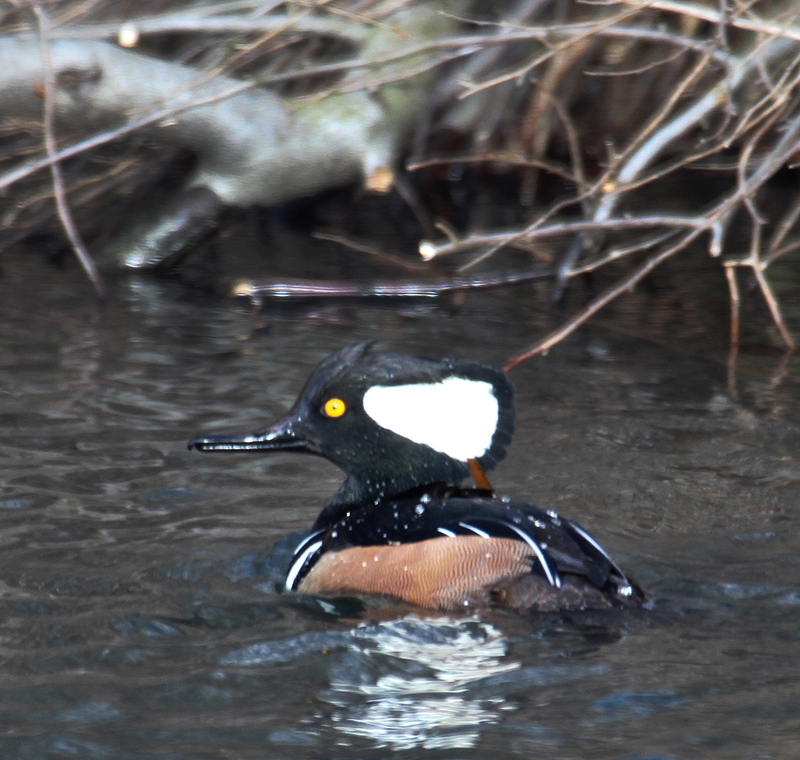 A Hooded Merganser swims in a pond in Danbury, Conn., Dec. 2016. 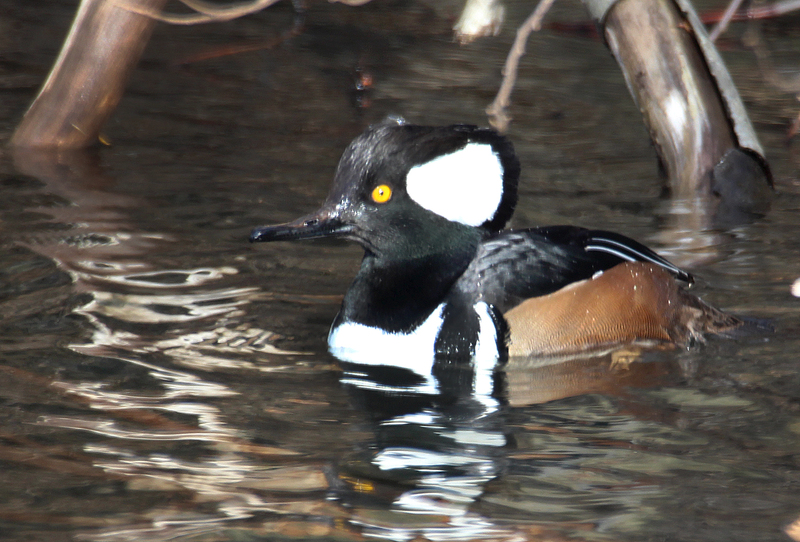 Here’s a nice male Hooded Merganser I spotted at a pond in Danbury, Conn., on the second-to-last day of 2016. Goodbye 2016. Let’s see what 2017 brings us. Happy New Year and thanks for supporting http://www.BirdsofNewEngland.com in 2016. Here’s the latest For the Birds column, which runs weekly in The Hour (Norwalk, Conn.), The Keene (NH) Sentinel and several Connecticut weekly newspapers. 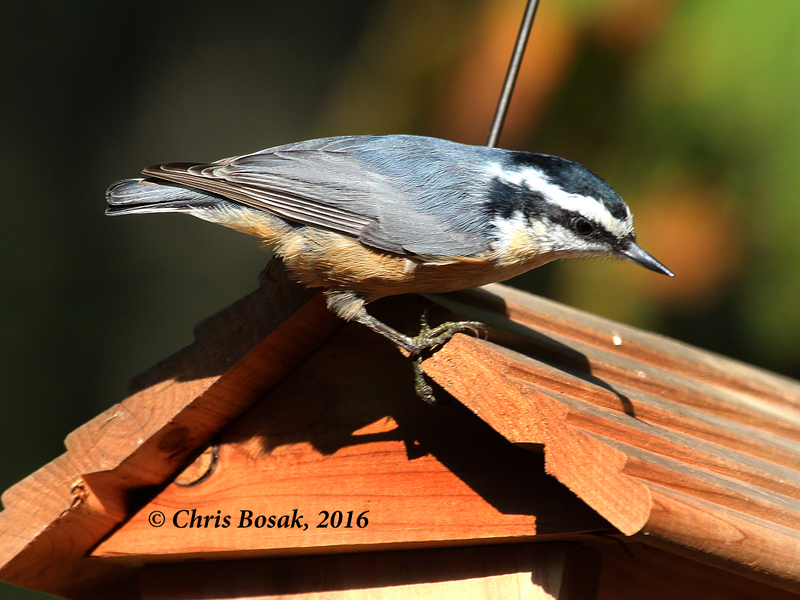 I wrote three weeks ago about my affinity for the nuthatches we see in New England. In the middle and southern parts of the region we see white-breasted nuthatches much more frequently than its smaller cousin, the red-breasted nuthatch. The latter variety, however, is seen more often in the northern reaches of New England. The red-breasted nuthatch does show up at feeders in the middle and southern parts, especially in fall and winter, but not too often and in varying degrees depending on the year. In fact, the little birds will venture all the way to Florida during winter migration. With that said, I was happy to receive an email from Dean a few days after that column appeared. A few days after Dean wrote me that email, I was sitting on my deck watching my feeders. 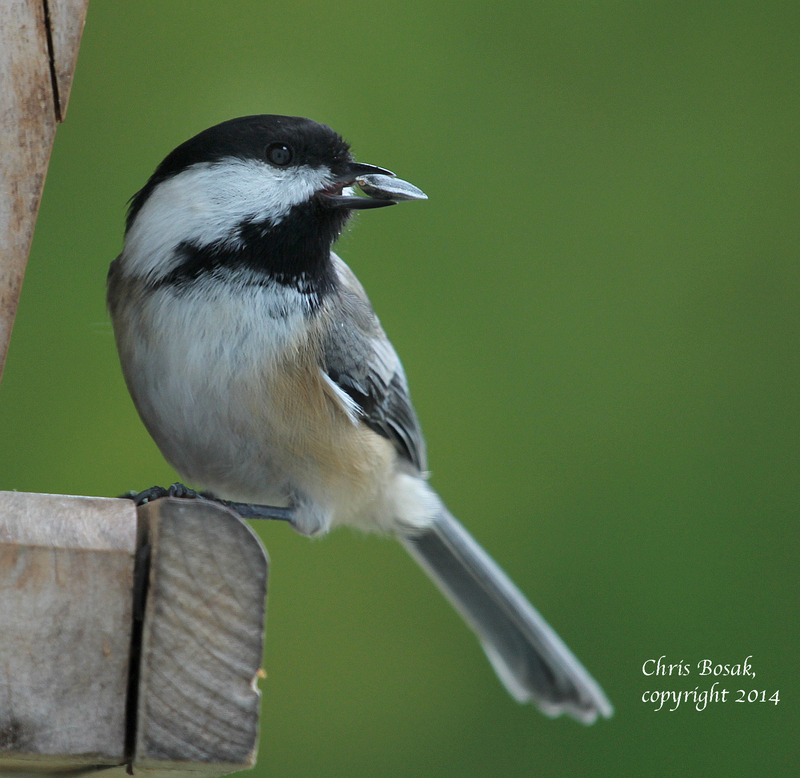 It was an unending flurry of black-capped chickadees, tufted titmice, white-breasted nuthatches and downy woodpeckers. I got so tuned into seeing those species that it didn’t immediately register in my brain that a new arrival had appeared. Here’s a video of a canoe ride I took this morning (Oct. 20, 2015) on Merganser Lake in Connecticut. Again, slow bird day but nice fall colors. 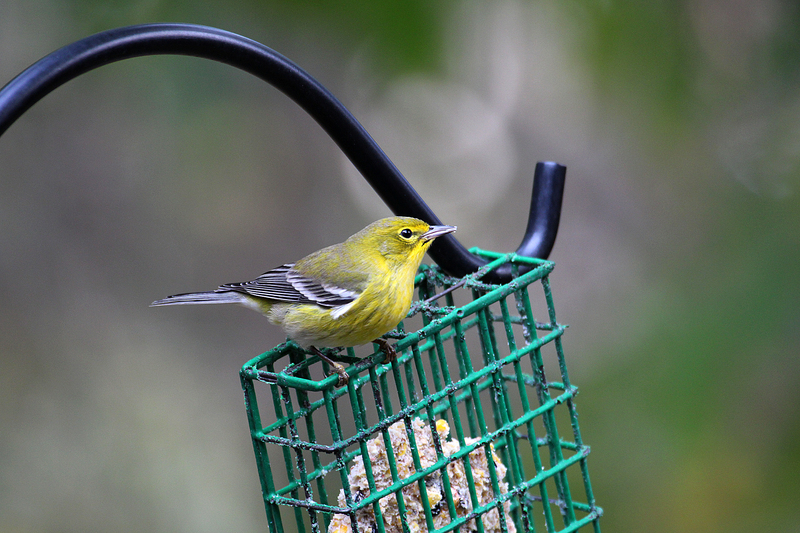 A Pine Warbler visits a feeder in New England in fall 2015. 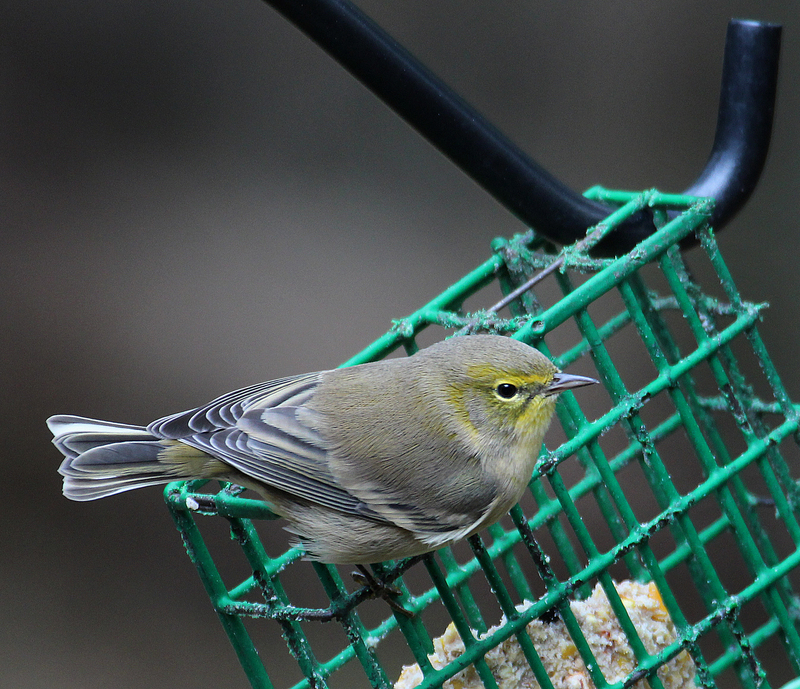 A Pine Warbler visits a feeder in New England, fall 2015. Never at any of my former homes where I’ve maintained birdfeeders had I seen a warbler at the feeder. A few weeks at Merganser Lake and today alone I had three.